for a week of observing under some of the darkest and most stunning night skies in the world! The next OzSky Star Safari to Australia is March 21 - 28, 2020. We meet in Sydney and then head out to our dark site for seven nights under pristine Southern Skies. Register Now to secure your place at one of the next OzSky Star Safaris. 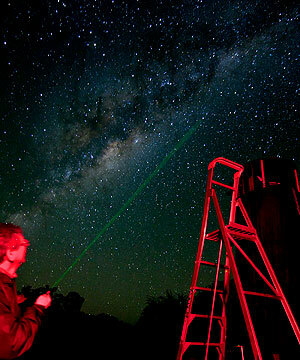 The primary aim of the OzSky Star Safari is to provide astronomers from the Northern Hemisphere with not only a unique Australian cultural experience, but more importantly a unique opportunity to experience the grandeur of the southern night skies through a number of large, high quality astronomical instruments without the need to transport one's own telescopes from one side of the world to the other. Previously named the Deepest South Texas Star Safaris due to the majority of those attendees coming primarily from Texas, the new name "OzSky Star Safari" has now been adopted to reflect the expanding demographic of amateur and professional astronomers now attending this popular event on a regular basis. The OzSky Star Safari is held on the outskirts of Coonabarabran, NSW ("The Astronomy Capital of Australia") and is scheduled for March 21 - 28, 2020. For more details please use the above menu links or Register Now to secure your place at the next OzSky Star Safari. The OzSky Star Safari is also a great way to decide on what sort of telescope might be best for you, if you're currently looking to upgrade or get your first telescope. We are obsessed with the best, which is why we are proud to showcase a wide range of Obsession Telescopes - The Ultimate Deep Sky telescopes, combined with the power of the Argo Navis Digital Telescope Computer on most of the instruments.